Harry Potter and the Cursed Child won the Tony for best play on Sunday while The Band's Visit swept the musical categories with 10 wins, including the top award best musical at Broadway's annual honours for the best in theatre. Glenda Jackson and Andrew Garfield took home acting prizes and rocker Bruce Springsteen received a special Tony, while a revival of the AIDS drama Angels in America was named best play revival and Once On This Island won best musical revival. But the biggest surprise of the night came when Robert De Niro, appearing on stage to introduce Springsteen, used the F-bomb against US President Donald Trump. De Niro's comments brought the cheering crowd at Radio City Music Hall to its feet but were bleeped for US television audiences. The Band's Visit, about Egyptian musicians stranded in a small Israeli town, also won acting awards for stars Tony Shaloub, Katrina Lenk and Ari'el Stachel, as well as best book, score, director, orchestration, sound design and lighting. It lost just one category among its 11 nominations, with its 10 wins just two shy of the record for any show set by The Producers. ""I avoided so many events with them (his parents) in the past because I pretended that I was not Middle Eastern," said Stachel, whose father is of Yemeni and Israeli heritage. He also praised "a cast of actors who never believed they would be able to portray their own races. Harry Potter, a record-setting $69 million two-part production set 19 years after the last of J.K. Rowling's best-selling novels about the boy wizard, won a total of six Tonys including best new play and best director. Garfield won best actor in a play for his acclaimed performance in Angels in America, which also won Nathan Lane his third Tony, as closeted conservative lawyer Roy Cohn, who died of AIDS. Praising playwright Tony Kushner, an emotional Lane said, "Tony wrote one of the greatest plays of the 20th century, and it is still speaking to us as powerfully as ever in the midst of such political insanity. "Kushner, noting it was 21 weeks until the mid-term congressional elections in the United States, continued the political vein adding, "21 weeks to save our democracy." Jackson, 82, returning to Broadway after 30 years and a lengthy term as a British politician, was named best actress for her tour-de-force performance in Edward Albee's Three Tall Women. Laurie Metcalf won her second Tony, playing a younger version of Jackson's imperious character in Three Tall Women. 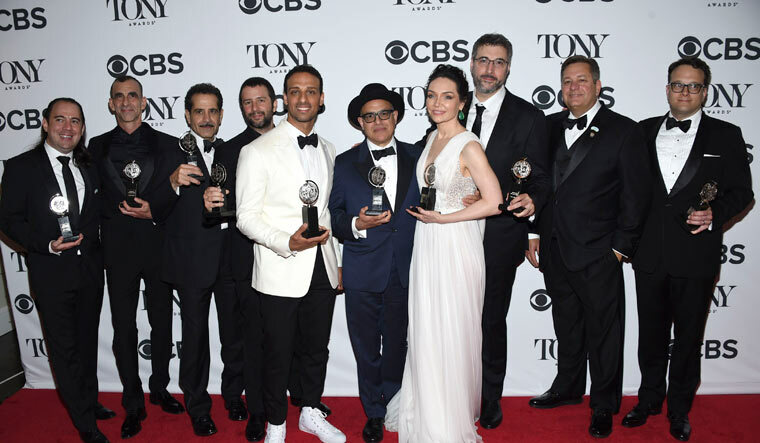 Veteran actress Chita Rivera and British musical impresario Andrew Lloyd Webber received lifetime achievement awards, while actor, writer and comedian John Leguizamo was given a special Tony for his one-man show, Latin History for Morons. The Tonys, hosted by singer-songwriter-actors Josh Groban and Sara Bareilles, capped another record year on Broadway with $1.7 billion in box office receipts, despite the smallest number of new productions in 20 years.